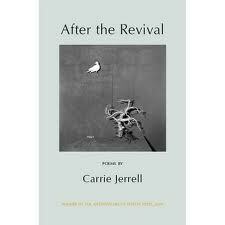 This poetry pick comes from a collection titled “After the Revival” by Carrie Jerrell, which was recommended to me as a book I would like. The collection won the 2008 Anthony Hecht Poetry Prize. you would know I tie each bale with sisal twine and secrets. you would know I hear vespers in the auger’s rush. beneath cathedraling white oaks and hickory. unplaiting the amber linens of my hair. This entry was posted in Zingara Poetry Picks and tagged After the Revival, Anthony Hecht Poetry Prize, Carrie Jerrel, Zingara Poetry Picks on December 14, 2011 by Lisa M. Hase-Jackson.